When the littlefoodie was born first one of the things that I missed most was getting out to restaurants for lunch and dinner. I feared that when I became more mobile, restaurants wouldn't be as accommodating as when I went without a baby. Over the last few months Ive become braver and now get out as much (if not more) than I did before, although mostly for brunch and lunch rather than dinner. The topic of how baby friendly restaurants regularly comes up with friends so as I eat my way around Dublin for the remainder of my maternity leave I will post restaurant reviews here with comments on how baby friendly they are. Yesterdays visit was to the Woollen Mills at the Ha'penny bridge. Food - I had the turkey sandwich with salads and my friend had the cuban sandwich. Both sandwiches were so good that neither of us wanted to share. The sandwiches came on homemade ciabatta with a choice of salads or soup (both come in at under 10€). 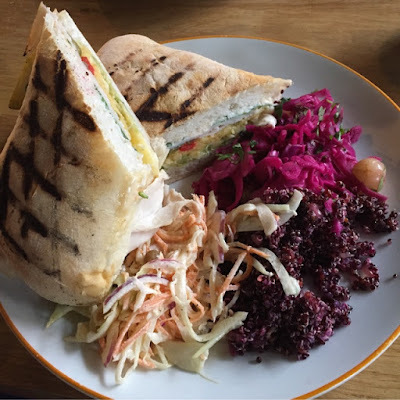 This was by far the best sandwich I have eaten in Dublin in a long time and consisted of turkey, guacamole, crushed tortilla (strange) and chipotle mayo. We shared a starter of jerusalem artichoke hummus to share which had a lovely smoky taste to it but wasnt really necessary given the size of the sandwich plate. 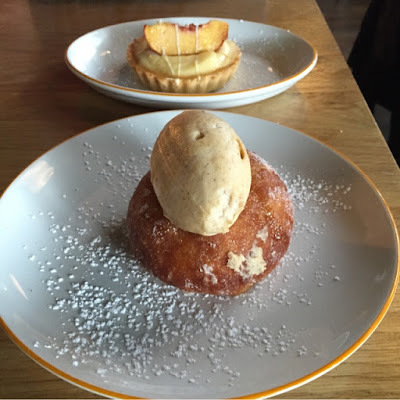 As dessert I had the doughnut of the day, a magical concoction of doughnut perfection stuffed with apple and topped with an amazing cinnamon mascarpone and my friend had a peach custard tart (too much custard, not enough peach). Ive been to the Woollen mills twice before and really enjoyed on both occasions so I will definitely be going back. They take excellent ingredients and know what to do with them. Space for buggy- Fairly limited, you wouldn't want to be meeting friends who also have buggies unless you were willing to sit outside. Calling in advance would be advisable if you are meeting a few people with buggies. Service - Our server seemed to be a bit disinterested in helping get the buggy to the table when I arrived. When ordering both courses we had to ask other people who told us they would ask our server to come over. Service of 10% was added to the bill automatically which may be part of the reason that the service wasnt great. Overall the staff didnt seem at all bothered that I had a baby with me which was good as said baby has just learned how to shriek! Table booking - I booked the table using their online booking system and notified them through this that I would have a buggy with me. Baby led weaning - what is it and why?